Request a quote for a bulk order for Pol II monoclonal antibody - Classic. Please fill out the form here below. Your local sales account manager will get in touch with you shortly and send you a quotation based on your requirements. Monoclonal antibody raised in mouse against the B1 subunit of RNA polymerase II (polymerase (RNA) II (DNA directed) polypeptide A) of wheat germ. Interacts with the highly conserved C-terminal domain of the protein containing the YSPTSPS repeat. ChIP assays were performed using human HeLa cells, the Diagenode monoclonal antibody against Pol II (cat. No. C15100055) and optimized PCR primer pairs for qPCR. ChIP was performed with the “iDeal ChIP-seq” kit (cat. No. C01010051), using sheared chromatin from 1 million cells. 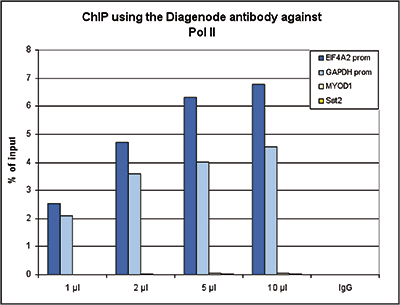 A titration consisting of 1, 2, 5 and 10 μl of antibody per ChIP experiment was analyzed. IgG (2 μg/ IP) was used as a negative IP control. Quantitative PCR was performed with primers specific for the promoter of the GAPDH and EIF4A2 genes, used as positive controls, and for the MYOD1 gene and the Sat2 satellite repeat, used as negative controls. Figure 1 shows the recovery, expressed as a % of input (the relative amount of immunoprecipitated DNA compared to input DNA after qPCR analysis). ChIP was performed on sheared chromatin from 1 million HeLaS3 cells using 2 μl of the Diagenode antibody against Pol II (cat. No. C15100055) as described above. The IP’d DNA was subsequently analysed on an Illumina HiSeq. Library preparation, cluster generation and sequencing were performed according to the manufacturer’s instructions. The 51 bp tags were aligned to the human genome using the BWA algorithm. Figure 2 shows the enrichment along the complete sequence and a 1 Mb region of the X-chromosome (fig 2A and B) and in genomic regions of chromosome 12 and 3, surrounding the GAPDH and EIF4A2 positive control genes (fig 2C and D). Whole cell extracts (40 μg) from HeLa cells transfected with Pol II siRNA (lane 2) and from an untransfected control (lane 1) were analysed by Western blot using the Diagenode antibody against Pol II (Cat. No. C15100055) diluted 1:500 in TBS-Tween containing 5% skimmed milk. The position of the protein of interest is indicated on the right; the marker (in kDa) is shown on the left. 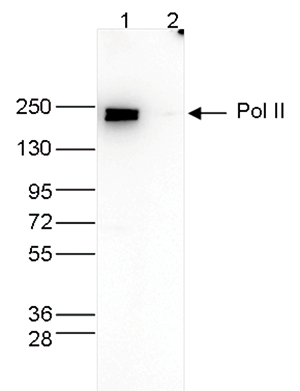 Diagenode strongly recommends using this:	Pol II monoclonal antibody - Classic (Diagenode Cat# C15100055-100 Lot# 008). Click here to copy to clipboard. Gap junction protein Connexin-43 is a direct transcriptional regulator of N-cadherin in vivo. A Non-catalytic Function of SETD1A Regulates Cyclin K and the DNA Damage Response. The oncofusion protein FUS-ERG targets key hematopoietic regulators and modulates the all-trans retinoic acid signaling pathway in t(16;21) acute myeloid leukemia. Akkers RC, Jacobi UG, Veenstra GJ. Genome-wide profiling of LXR, RXR and PPARα in mouse liver reveals extensive sharing of binding sites. The human histone H3 complement anno 2011. Coactivation of GR and NFKB alters the repertoire of their binding sites and target genes. UPF2 is a critical regulator of liver development, function and regeneration.